Hi friends! My name is Lori, I LOVE music and I can't imagine my life without it. I believe music is a gift and I always feel so grateful to be able to share that gift with others. Working at Music & Arts gives me many opportunities each and everyday to help people on their own musical journeys, and that can be so rewarding and a lot of fun! 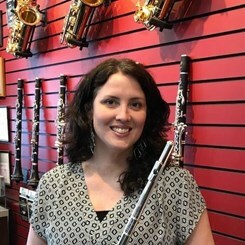 I studied flute and voice at the University of Southern Mississippi and I currently perform with a number of local ensembles. These days I play on a Yamaha 677 professional flute, and as vocalist with the Columbia Big Band, I use the Shure SM58 microphone, the industry standard in vocal mics.